James Benson Tindall, Jr., 93, lifelong resident of Albemarle County, died at 11:40 a.m., on Saturday, February 7, 2009, at Martha Jefferson Hospital in Charlottesville, VA. He was born in Hatton, Virginia, the son of James Tindall, Sr., and Mary Tapscott Tindall, on October 17, 1915, and lived there most of his life. Mr. Tindall was a lifelong member of Centenary United Methodist Church in Buckingham County, and his picture and a plague honoring his dedication and services are displayed at the church. Mr. Tindall is survived by his wife of 34 years, Bickie Martin Tindall of Charlottesville; two sisters, Katheryn Tindall Hundley of Lexington and Virginia Tindall Schilder of McLean; a niece, Mary Lou Hunt; three nephews, James Tindall Duncan, William Duncan, Jr., and Thomas Schilder; a great-niece, Virginia Schilder; a great-nephew, Tommy Schilder; and two stepsons, Gary and Steve Martin. Mr. Tindall was preceded in death by his parents and a sister, Elizabeth Tindall Duncan. He was also married to Frances DeBerry Tindall until her death in 1971. James, as he was known to his friends, owned and operated the General Merchandise Store at Hatton until he retired on February 28, 1975. The Hatton Store also served as a depot for the C & O Railroad (now part of the CSX Railroad) and as a rural post office with postal deliveries twice a day by train. 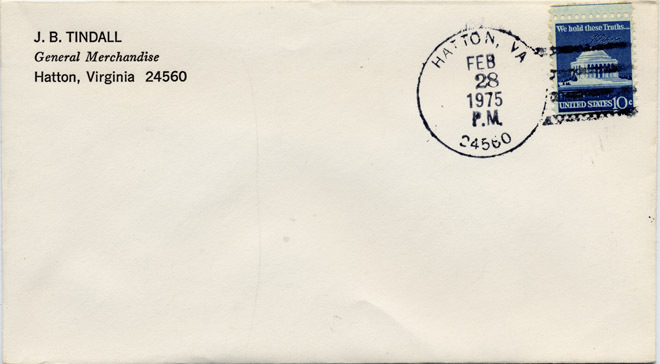 James was both Postmaster of Hatton and the Hatton Depot Agent; shown below is a Hatton cachet on a stamped envelope from J.B. Tindall Merchandise, dated 28 February 1975. Hatton is located on the James River north of Scottsville, where James Tindall, Sr., started a business in 1911. The business acquired the pole-operated "Hatton Ferry" and employed an operator to transport business between the Buckingham and Albemarle sides of the James River. The ferry allowed Buckingham residents to transport pulp wood and railroad ties to the depot for sale, and the Hatton General Merchandise Store provided all the essential goods and wares needed for daily life in a rural environment. The Hatton Ferry operated from sun up to sun down when the water level allowed. It is believed on one occasion a flood washed the ferry away, and it was subsequently located eight miles down river. Ferry operators from 1911 included Bolling Bryant, Monroe Napier, Luther Randolph, Harvey Briddle, Raymond Hackett, and Ned Hocker. The Hatton General Merchandise Store transferred ownership of the ferry to the State of Virginia in 1940, but the Tindalls kept the store in operation until 28 February 1975. To assure survival of the historical Hatton Ferry, James Tindall worked with others to persuade the Albemarle Historical Society to take over the Hatton Ferry's operation. The ferry continues to operate three days a week during the summer months. James also met with the Scottsville Museum on several occasions in 2000-2007 to recount events and experiences that took place during his long life in southern Albemarle County. Thank you, James, for all of your efforts to preserve the history of Hatton Ferry, the Tindall's store at Hatton, and the Hatton Post Office! 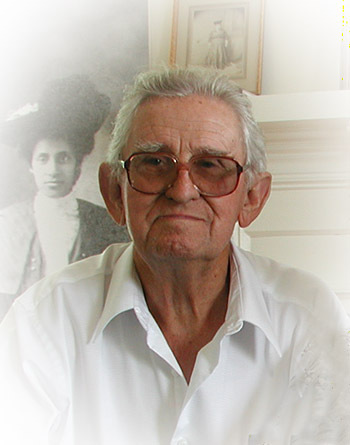 A funeral service for James Benson Tindall, Jr., was conducted at 11 am, Tuesday, 10 February 2009, at Centenary United Methodist Church by the Reverend Jim Radford and the Reverend Manning Harold. Burial followed at the Centenary United Methodist Chruch cemetery. Originally published in the Daily Progress, 9 February 2009.